Brexit, even after all these months, is still capable of surprises. A few weeks ago, I had dinner with a couple of old friends. They’re both Leave supporters. I’m a Remainer, as was my companion. We had met each other — all four of us, actually — through the student politics of the late 1980s. None of us is shy about expressing a point of view. And yet this dinner, which by rights ought to have ended either with a flaming row or, perhaps worse, with a display of ever-more-icy contempt for each others’ abject wrongness, was — from my point of view, at least — an extremely happy occasion. It says something sad about today’s politics that I found myself, afterwards, picking apart why this conversation — unlike so many conversations about Brexit, both online and in real life — had been so interesting, constructive and friendly. For one thing, as we had all known each other for so long, it was possible to appeal to a corpus of common assumptions. It probably also helped that, as we all genuinely like each other, none of us immediately assumed, the minute someone said something with which we disagreed, that the speaker was either a monster or an idiot — that there was quite a lot of good faith on show. Indeed, the climate of mutual respect was powerful enough that I found myself thinking, at various points, ‘that’s not the way I see things, but if X sees things that way, maybe it’s worth considering’. Finally, there was a pervasive sense, hard to pin down but expressed at all sorts of points, that it wasn’t worth falling out over this. For a long time, I had no particular interest in reading about the Second World War. History, per se, always mattered a lot, which is how I ended up with a doctoral degree from Cambridge University, the odd insight into how the Tudor reformations did or didn’t play out in the flatter parts of west Norfolk, and a lasting aversion to academic infighting. But because I was born in the mid 1960s, WW2 somehow never registered as ‘history’. Like my parents’ dated taste in music, their books, indeed the blind-spots of their politics, WW2 was simply a generational experience which I could regard with a sort of semi-detached bemusement. It wasn’t my own experience, true, but it never really seemed like ‘history’ either, if only because when I was growing up, every middle-aged person I met spoke of those wartime years with absolute familiarity. ‘The war’, as everyone called it, was both too far and to near to me to come into easy focus. Hence I ignored it. On Thursday, 3 May — tomorrow — I am planning to vote in the local elections. As a resident of West End Ward, Westminster, I’ll be voting for the Liberal Democrat candidates. I will be doing this in order to make the strongest statement I possibly can against the self-induced disaster that is Brexit. In the unlikely event that anyone wants to follow my thought process in doing so, my reasoning is explained below. For many decades, I was a Tory. I am no longer a Tory, though, for reasons mostly if not entirely related to Brexit, set out at absolutely shocking length here. This article first appeared as a guest post at Mars Hill, Paul Burgin’s excellent blog. Although I’m British now, I was born in Raleigh, North Carolina, in the American South, and I lived there until I went off to college in 1984. Raleigh wasn’t a bad place to grow up, at least for someone like me. Still a slightly sleepy, genteel place then, its wide streets shaded by mature trees and, downtown at least, blessed with plenty of handsome antebellum houses, the old-fashioned southern charm was constantly undercut, before it had the chance to grow cloying, by more bracing influences: three first-rate universities all within a short distance of each other, for instance, and the presence of something called the Research Triangle Park, home to forward-looking enterprises such as IBM and various pharmaceutical companies. As a result, the Raleigh of my childhood attracted intelligent, hard-working people not only from around the USA, but also much further afield. My tiny, Episcopal Church-run school placed me side by side with children whose parents had come from Egypt, Iran, Vietnam. Although it was a church school, I grew up with Muslims, Jews, Catholics, protestants of every possible persuasion and even the odd out-and-proud atheist. The universities also ensured that we had more than our fair share of high culture: a very good art museum, as well as concerts and theatre performances from world-famous groups. A thriving farmers’ market co-existed with shops where it was possible to buy Thai shrimp paste. I have only ever heard one story that makes Theresa May sound like a genuinely good person. The source for it is an old friend from university days. We met through CUCA, the Cambridge University Conservative Association. My friend is still a Tory, whereas I gave up on the party roughly thirty years later during the course of May’s 2016 conference speech — a bumpy journey recalled at some length here. Anyway, the story involves a visit by my friend to a speaker meeting organised by her local Conservative association. At the time, my friend was trying to balance a career as a corporate lawyer with her demanding role as the mother of an infant and a degree of continued political engagement, and in a slightly desperate moment of multi-tasking, brought her baby along to the meeting with her. In the normal way of these things, as soon as the distinguished guest began speaking, the baby kicked off. My friend tried to calm the baby by breastfeeding him/her, as discreetly as possible. For this, she was rewarded with a range of disapproving looks from the mostly elderly, entirely disapproving audience. In the car-park afterwards, preparing to leave, my friend was feeling as many of us may have felt under similar circumstances — angry, defensive, embarrassed — maybe even a bit tearful. Getting into her car, then, she noticed the speaker hurrying out towards her, apparently anxious for a word. Rather to my friend’s surprise, the speaker could not have been more supportive — praising the qualities of the baby, talking about how hard it must be to balance work and family, unhappy at the audience reaction and passionately defending my friend’s decision to breastfeed in a public place. The speaker was, of course, Theresa May. I am repeating this story in the interest of scrupulous fairness. Having said that, though, let’s remember that after my thirty years in the party, this is literally the only positive story I have ever heard about Theresa May. The other stories mostly revolve around tone-deafness, rigidity, humourlessness. Often there is a degree of intellectual limitation in the mix as well. Not one of these stories suggests that May got where she is through anything other than a dogged, principle-free, vindictive, deeply joyless strand of personal ambition. Nor do any of them imply that she has much to offer either the Tory party or the United Kingdom. Let me preface what will necessarily be a personal, subjective yet sustained pre-Brexit lament with a slightly alarming confession. In 2001, I worked for several months on Iain Duncan Smith’s leadership campaign, and then for a few more months in the Leader’s Office at CCO. As a lifelong Tory who voted ‘Remain’ and who parted company with the party in September 2016, part way through Theresa May’s ‘citizen of the world’ speech, I now heartily regret this brief chapter of my life, realise it constituted monumentally bad judgement on my part, and wish it had never happened. Sorry, everyone. My reason for reminding the world of this embarrassing interlude, however, has less to do with some random masochistic-exhibitionist personal quirk than it does with insisting on a more general historical point regarding Britain’s rupture with the European Union, which Theresa May has announced that she will trigger tomorrow. There’s a nice irony — ‘nice’, that is, in the older sense of the word — in the fact that the day of Martin McGuinness’ burial is being marked in London with blue flashing lights, bridges closed off with police tape, helicopters circling low overhead and tributes to a brave police constable, murdered while carrying out his job. At least for people of a certain age, it is these things, more than Tuesday morning’s fulsome farewells to a dead peace-maker, that conjure up the man. Whatever dark hints 2016 may have provided to the contrary, conventional wisdom isn’t always wrong. Having seen James Graham’s This House at the Garrick Theatre last night, I can confirm what more or less every professional or casual critic, UK politics geek, old Labour hack, veteran theatre-goer, friend or sundry acquaintance will already have told you, which is that This House is a hugely compelling, satisfying play, and that James Graham’s is a voice to be welcomed with unalloyed enthusiasm. This is all the more remarkable when one considers the play’s apparent modesty of aspiration. This House takes place not on the floor of the House of Commons, that great expansive theatre of parliamentary democracy with its larger-than-life characters and set-piece battles, but rather in what it describes as the ‘engine room’ of the House of Commons — the offices of the government and opposition whips, hidden down in the badly-maintained bowels of the building, wherein much of the real business of politics is carried out by figures who, at least as far as the general public is concerned, are all but nameless and faceless. Its timespan stretches from the February 1974 general election to the 1979 vote of no confidence that brought down Jim Callaghan and ushered in the age of Margaret Thatcher. During these not-quite-five years, the Labour Party struggled to govern with an unfeasibly small, fragile, continually embattled majority. How the Labour whips made this happen — and at what cost — is the central focus of This House. Modesty? Imagine, perhaps, trying to sell to a West End Theatre the idea that procedural wrangles mostly carried out by men in suits in sparsely-furnished basement rooms during the late 1970s are actually really, really interesting. Or to put it another way, think of what might have happened if Shakespeare, having decided for whatever reason to cut from Henry V not only the king himself but also all the higher nobility, made the whole play centre on Pistol, the captains and the Boy, always speaking in prose, with the battles invariably taking place off-stage, hence seen only through their impact on logistics. This, more or less, is the challenge that Graham has set himself. That he succeeds so brilliantly is surprising enough that, two day later, I can’t entirely resist the temptation to try to pick apart his achievement, and see how he managed to do it. Why does everyone, correctly, love This House so much? Perhaps the most surprising aspect of this slyly surprising play reposes in its manifest, unabashed and deeply unfashionable lack of cynicism. A month into the Trump era, let’s start with the positives, such as they are. 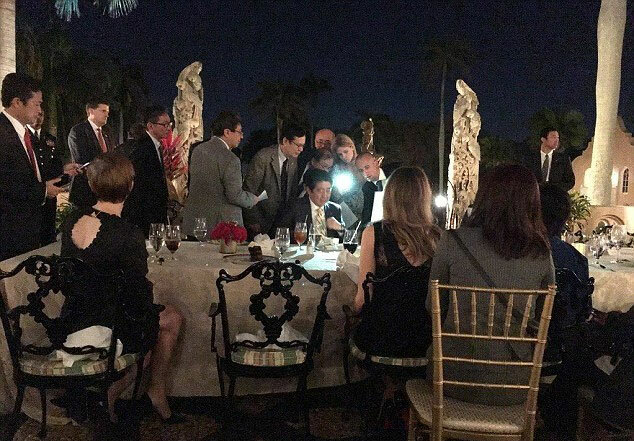 … was taken by a random member of Donald Trump’s Mar-a-Lago Club in Palm Beach, Florida, using a camera phone, and yet there’s a great deal in it. On the late afternoon of Friday, 20 January 2017, I’ll be in Norfolk, in a village perched on the edge of the North Sea. By 16.30 or so I’ll probably be in my comfortably scruffy kitchen, settled down in the armchair next to the old Aga, watching the BBC news on my laptop computer. Outside in the gathering dusk, the pheasants will shout their usual crepuscular warnings at each other, as the sleek fat farm cats make their regular rounds and night tucks itself in around my 500-year old former parsonage, under a waning quarter moon. All will be well, and all manner of things will be well, as our local St. Julian of Norwich put it. And at the same time, Donald J. Trump will be sworn in as the 45th president of the United States. Enter your email address to follow News from Norfolk and receive notifications of new posts by email.